Henry David Thoreau (1817-1862) and John Burroughs (1837-1921), whose essays, books, and poetry on natural history and phenology popularized going into the woods to observe nature--rather than taming or destroying it. Naturalists John Muir (1838-1914) and George Bird Grinnell (1849-1938) who founded, respectively, the Sierra Club and the National Audubon Society, providing venues for everyday citizens to enjoy the out-of-doors AND to take action on behalf of nature. Twenty-sixth American president Teddy Roosevelt (1858-1919) who--with strong encouragement and wise guidance from Gifford Pinchot (1865-1948), director under him of the Forest Service--created the U.S. National Park system. 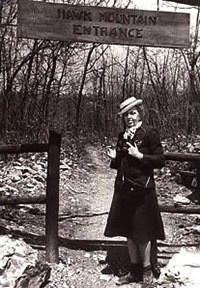 Rosalie Edge (1877-1962, above right), a steadfast woman who in 1935 in eastern Pennsylvania established Hawk Mountain Sanctuary, the world's first preserve for migratory birds of prey; and marine biologist Rachel Carson (1907-1964), who almost 30 years later sat on the Sanctuary's North Lookout, formulating her thoughts for Silent Spring--a best-selling book that called for quick reduction in pesticide use that, in turn, may have saved American Bald Eagles for posterity. Educator and scientist Eugene Odom (1913-2002), who formalized the concept of an ecoSYSTEM in which every living and non-living thing on Earth--including humans--is connected to everything else. 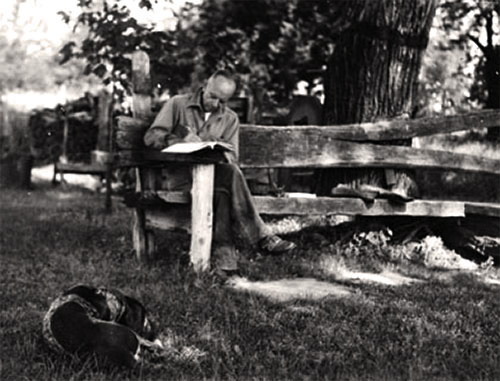 And finally, slightly out of chronological sequence, there's Aldo Leopold (1887-1948, right)--a forester, author, teacher, and philosopher described by some as the father of wildlife management . . . AND of the U.S. wilderness system . . . AND of environmental ethics. (We're pleased to report he also was a bird bander.) We save Leopold for last because he plays a prominent role in our photo essay that follows. This week we were far from Hilton Pond Center, marveling--especially after our recent return from tropical Costa Rica--at just how much snow Wisconsin received during the winter of 2007-08. Through mid-March of this year, Madison WI already had been smothered by 92 inches of white stuff, far surpassing its old single-winter record of 76 inches set in 1978-79. (We well remember that particular snow season, it being the first winter we were in grad school in neighboring Minnesota--where snow started on Halloween and stayed until almost May Day.) This year we went to Madison at the invitation of Kathy Miner (left), whom we met through her e-mail responses to our on-line nature essays and who eventually--with her husband Don--came to see Hilton Pond. 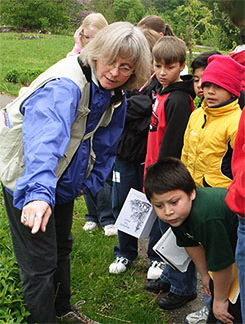 Kathy, an education naturalist (and poet) at the University of Wisconsin-Madison Arboretum, organizes a winter-long series of training workshops for amateur and professional naturalists and decided she'd like to have an end-of-season presentation about hummingbirds. She extended us an invitation--which we happily accepted--and arranged for our travel, lodging, and honorarium, so on 12 March we boarded a plane in Charlotte NC and flew northward, looking down through the starboard window at ever-increasing depths of snow the closer we got to Wisconsin. After an airport pickup and quick supper, Kathy took us to the University of Wisconsin main campus for our first gig--an evening lecture in the "Wednesday Nite @ The Lab" series sponsored by UW alumni for themselves and the public. We were pleased to see several middle school and junior high students among the 90 or so people present, to meet Kathi and Michael Rock (who publish a hummingbird newsletter), and to learn Wisconsin Public Television was taping our hummingbird presentation for future broadcast. Thursday afternoon following our talk we shuffled around the Arboretum itself--not going far because we were still hampered by an ankle broken during this year's Costa Rica trip; thus, we were fortunate some local wildlife came to us. 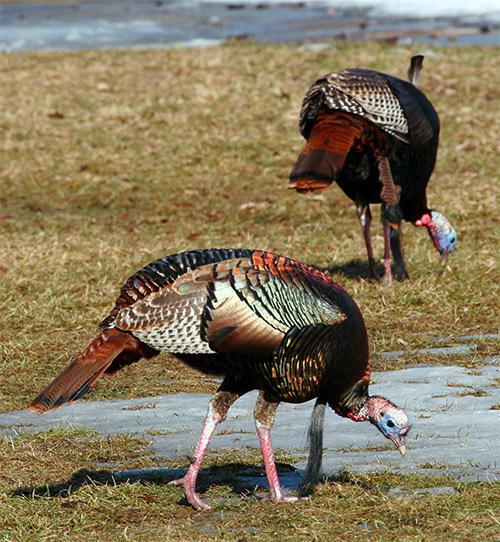 In one case, a flock of Wild Turkeys (above)--all toms, if we can judge by the sizes of their spurs and enormous "beards"--approached Kathy Miner's office window, allowing us the pleasure of observing their incredibly iridescent plumage from close range. We fired off dozens of digital exposures as these big birds strutted and pecked at seeds in small patches of grass exposed by partial thaw. 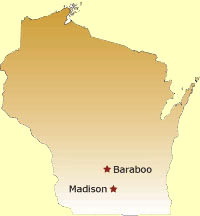 The next day--Friday--was another a "big day" for us personally, but for a different reason: Kathy had arranged for a guided tour at the recently constructed visitor center of the Aldo Leopold Legacy Center, about an hour from Madison near Baraboo WI (see map above right). We were delighted by this bonus chance to explore south central Wisconsin and the very place where Leopold further developed and implemented his seminal ideas on wildlife management and conservation--AND where he got his inspiration for A Sand County Almanac. We were greeted at the snow-covered Leopold Center by education coordinator Jennifer Kobylecky, a knowledgeable and personable young woman who delivered what may have been the most polished guided tour we've experienced in our many years of visiting nature centers around the country. 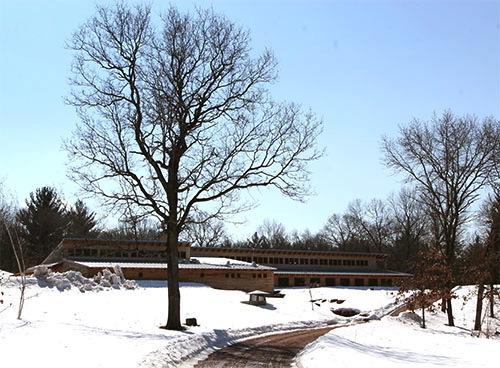 Jennifer knew the new Legacy Center inside and out--after all, she helped construct the building (below left)--and she also had a comprehensive understanding of the history and importance of Aldo Leopold's life and work. 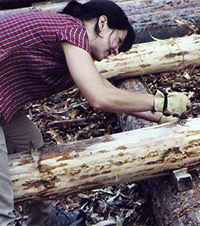 (Incidentally, our Madison host Kathy Miner also helped raise the Leopold Center; like Jennifer, she and other Leopold-loving volunteers from across Wisconsin spent time stripping bark from pine logs that eventually became roof beams.) Although deep drifts kept us from a complete tour of the Legacy Center's exterior, Jennifer did a great job explaining all the energy-saving attributes of the structure itself, from photovoltaic solar panels on the roof to staggered stud walls and super-insulation that diminish transfer of heat from inside the building. 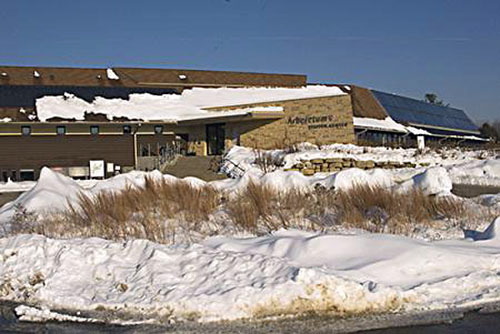 The structure uses too many innovative techniques for us to outline here; to quote the Aldo Leopold Legacy Center Web site, its headquarters "received a Platinum LEED Certification from the U.S. Green Building Council. Following a rigorous assessment, the Leadership in Energy and Environmental Design (LEED) program awarded the Legacy Center 61 points of 69 possible points, more than any other building yet rated in the world." That rating, we'd say, is a feather in the Legacy Center's cap and one of which their namesake would be justly proud. 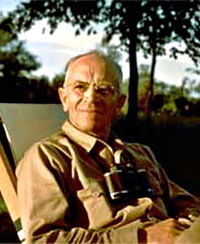 We suspect Aldo Leopold also would be pleased the Legacy Center--constructed almost entirely of wood--made use of pines and hardwoods planted more than a half-century ago by Leopold and his family. With that comment, this is probably a good point in our essay to explain a little more about who Aldo Leopold was and why we were so pleased to visit the hallowed grounds of his old farm near the new Legacy Center. Aldo Leopold (right), born in 1887 in Burlington IA, showed an early affinity for nature; as a boy he loved to hunt and fish but also to simply sit in the out-of-doors and make observations and sketches. In 1909 he graduated from the Yale Forest School and began work for the newly created U.S. Forest Service in Arizona and New Mexico, where at the rather young professional age of 24 he was appointed supervisor of Carson National Forest. A decade later he formulated a proposal to make Gila National Forest a wilderness area--the first place in the U.S. so designated. In 1924 he was transferred to Madison WI and in 1933 wrote and published the first textbook in the emerging field of "wildlife management." Shortly thereafter the University of Wisconsin awarded him a chair in game management--the first such appointment in the U.S. 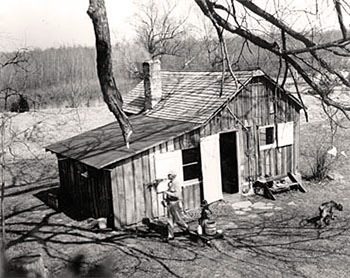 In 1935 Leopold decided to put his theories into practice when he bought for back taxes an old farm on the Wisconsin River near Baraboo. In the middle of a winter snowstorm, he took his wife and children to the site and--much to their initial chagrin-- ushered them into a dilapidated cabin that smelled of chickens and other livestock. Through the years the family refurbished this structure--affectionately known by all as "Leopold's Shack" (left)--and went about the arduous task of reclaiming the surrounding land. That first year the family planted 3,000 pine trees--most of which died in the final throes of the Depression-era drought--but Leopold forged ahead and planted similar numbers of pines and hardwoods in subsequent years. 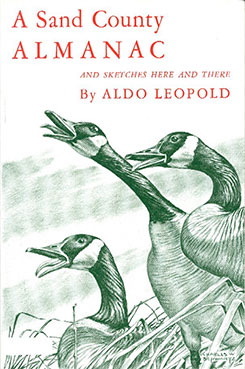 Skeptical at first, the children soon bought into Leopold's master plan; their memoirs--and their own life accomplishments in conservation fields--reflect the special nature of the grand experiment their father had designed. Because Leopold was an ardent journal-keeper (above), much about the many successes--and occasional failures--of his reclamation efforts has been preserved in his own hand by the University of Wisconsin and the Leopold Foundation. More importantly, Leopold's written records allowed him to systematically evaluate his efforts and to summarize them in technical journals and other publications. Of these, perhaps none has had so great an impact as A Sand County Almanac, a highly readable compilation of conservation essays that quickly caught the fancy of nature lovers across America. A Sand County Almanac (right)--initially entitled Great Possessions--was published in 1949, a year after Leopold died of an apparent heart attack while fighting a grass fire on a neighboring farm; it stands as one of the greatest conservation books ever written. More than two million volumes have sold, and we've known many naturalists and environmental educators who almost always carry a dog-eared copy in their backpacks. Our grandfathers were less well-housed, well-fed, well-clothed than we are. The strivings by which they bettered their lot are also those which deprived us of [now-extinct Passenger] Pigeons. Perhaps we now grieve because we are not sure, in our hearts, that we have gained by the exchange. The gadgets of industry bring us more comforts than the pigeons did, but do they add as much to the glory of the spring? 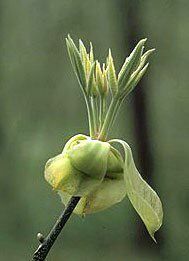 In June as many as a dozen species may burst their buds on a single day [Shagbark Hickory at right]. No man can heed all of these anniversaries; no man can ignore all of them. Conservation is a state of harmony between men and land. By land is meant all of the things on, over, or in the earth. Harmony with land is like harmony with a friend; you cannot cherish his right hand and chop off his left. That is to say, you cannot love game and hate predators; you cannot conserve the waters and waste the ranges; you cannot build the forest and mine the farm. The land is one organism. Its parts, like our own parts, compete with each other and cooperate with each other. The competitions are as much a part of the inner workings as the cooperations. You can regulate themcautiouslybut not abolish them. Like winds and sunsets, wild things were taken for granted until progress began to do away with them. Now we face the question whether a still higher "standard of living" is worth its cost in things natural, wild, and free. For us of the minority, the opportunity to see geese is more important than television. 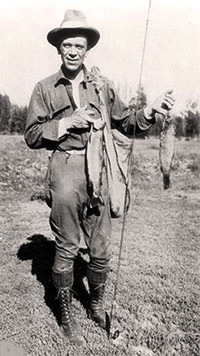 It was these sorts of quotations that are read by groups around the country during the first weekend of March, declared officially in Wisconsin as "Aldo Leopold Weekend." On 1-2 March this year (2008), Leopold enthusiasts from Baraboo to Athens GA to far-off New Mexico gathered for readings of his work. We missed the big celebration but made it to Wisconsin the following week, so we were grateful when Jennifer Kobylecky led us on a pilgrimage from the untramodern Legacy Center to the still-rustic farm Leopold bought back in 1935. 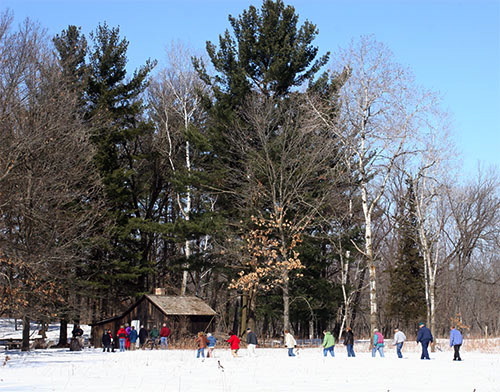 After driving a short distance down a country road, a small group of us braved the drifted snow and walked a few hundred yards to Leopold's Shack (above), maintained through the years in original condition by devotees and Leopold family members. It was quite a treat to watch as Jennifer undid the padlock on The Shack's front door--something Leopold himself must have done countless times during the decade or so he and the family spent there. Even more moving was to enter the edifice itself . 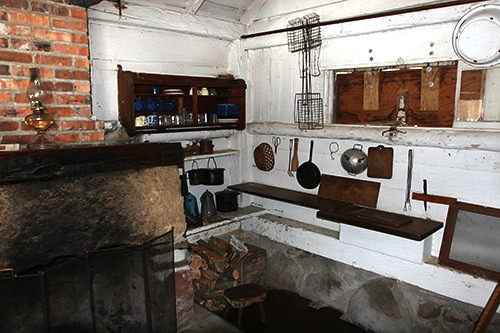 . . to look at the elegant simplicity of the stone fireplace and painted wooden walls and old enameled pans and iron skillets (above) . . . and to sit on the very benches Leopold himself made and used when he compiled his journals. 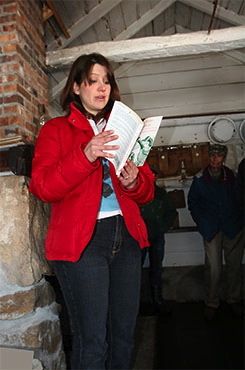 Rising to the moment, Jennifer pulled out a copy of A Sand County Almanac and read a few lines (left), eventually passing the book to others in the group who followed suit. This was a rare treat and a true inspiration: Something there is about speaking aloud a great man's words in the place where he wrote them, something that gives those words even greater meaning than before. 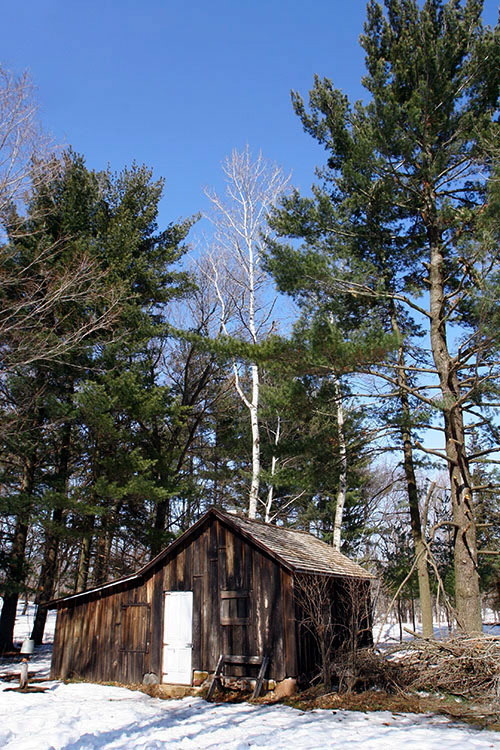 When the readings were over, Jennifer quietly ushered us out of The Shack and locked the door one more time; back in the sunshine we all had a brand new perspective on Aldo Leopold and his conservation ethic. As we trudged through drifts back to the vehicles, a dark object caught our eye against the white landscape. 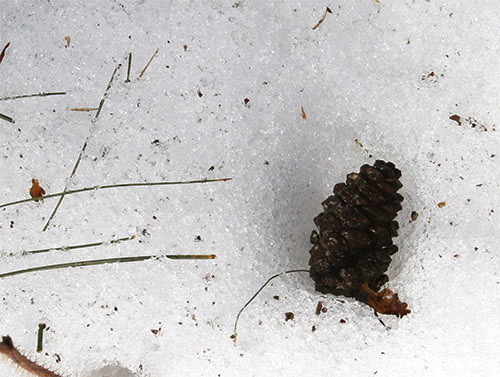 Almost instinctively, we aimed our camera and fired off a couple of quick shots before we realized what we had found: The partially opened cone of a Red Pine tree--absorbing solar heat and melting its way ever so slowly through the snow. Without doubt this cone (above) came from one of thousands of trees planted 70 years ago by Aldo Leopold, his wife, or one of his children as they tried to reforest a spent farm in the sand counties of Wisconsin. This tree grew alongside its neighbors to form a dense stand--not something a seasoned forester like Leopold would have wanted in the end. How appropriate that a few years ago the Aldo Leopold Foundation--with the blessings of Leopold's children still living--selectively harvested those crowded pines, taking out the smaller trees and converting them into timbers for the new Legacy Center. And how appropriate they left behind the tallest, straightest, healthiest trees in the woods, assuring that Aldo Leopold's legacy would go on forever--not only in his magnificent words but in future generations of pines from trees he himself had the wisdom and the energy to plant. Without Aldo Leopold and environmental heroes like Henry David Thoreau and Rosalie Edge and Eudene Odom, the natural world--and we humans--would be far worse off. From a personal perspective, we are indeed grateful for their example. In fact, without the collective words and actions of these giants, we might never have established Hilton Pond Center--where we try to show in our own small way what can happen when one ascribes to the "conservation ethic" of the late, great Aldo Leopold. I love all trees, but I am in love with pines. 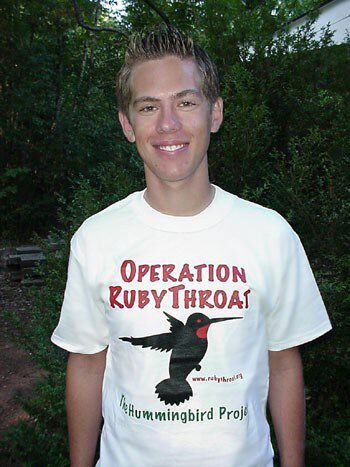 The highly coveted Operation RubyThroat T-shirt --four-color silk-screened--is made of top-quality 100% white cotton--highlights the Operation RubyThroat logo on the front and the project's Web address (www.rubythroat.org) across the back. Need a Special Gift for a friend or family member? Want to make a tax-deductible donation during 2008? --If you're curious about when to put up your feeders for spring migrant Ruby-throated Humminghbirds, please refer to our on-line Migration Map. --After banding a bumper crop of American Goldfinches during the last two weeks of February, the bottom dropped out and we managed to capture only 20 during the first half of March. We were gone from Hilton Pond Center to Wisconsin for part of that period, of course (see above), but even before we departed there was noticeable decline.